Explore the Grand Canyon with us. 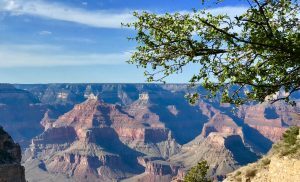 Our days at the Grand Canyon were more than magical-they were breathtaking!! We’ve written about our first impressions upon seeing the glory of the Canyon and we’ve attempted to post photographs that are representative of the majesty of this place (which, by the way, is impossible to capture although Stu has produced incredible photos!). But, there is SO much more to talk about! 1) People visiting here are from all over the world. We’ve talked to visitors (in 2 days) from China, Germany, the Netherlands, Japan, Spain, New Zealand, France-we could go on. Those we spoke with were shocked at the scale of America. Many found our country unexpected. Most had thought they would see the America they see on television shows and in movies and found the reality of places like LA disappointing. Especially Hollywood. The national parks and cities like San Diego were amazing to those with whom we spoke. One ranger told us that approximately 50% of visitors to GC are foreign, perhaps because Americans ” take the park for granted”. PLEASE VISIT THIS PLACE! I never even dreamed the GC would be so magnificent! Another person lamented that most visitors to our incredible national parks are over age 60. He is now dedicating his own blog to encouraging younger Americans to get out and see what could be lost if the next generations are not interested enough to preserve these treasures. 2) We strongly recommend staying in Tusayan. The National Park Service operates shuttles to and from Tusayan to the GC Park. Those shuttles stop at the IMAX Theatre, the Best Western Grand Canyon-Squire Inn, the Grand Hotel, and Big E Steakhouse. Stu and I considered hotels in Williams, but folks, after walking and viewing the GC for up to 7-8 hours in any given day, you will be too tired to drive another hour back to Williams. If you want to take in sunrises, that drive will have to begin extremely early. The shuttle buses literally dropped us at the door of the Best Western Grand Canyon-Squire Inn which saved us the 20 minute or so drive to the Park. We visited in April before crowds in summer and the parking lots at the GC Visitor Center were already packed with cars. Captured this sunburst as the sun was setting in the Grand Canyon. We HIGHLY recommend the Best Western in Tusayan. It is a beautiful hotel with indoor/outdoor pools, a fitness center, an outdoor lounge with a fireplace, buffet breakfasts and dinners (you pay extra in each), a very nice restaurant with steaks and prime rib, and a pub with pizza and hamburgers. 3) DO NOT BE DISCOURAGED by age or infirmity. The in-the-park shuttles (if you ride from Tusayan, you only have to show your pass when you board and not in the park) have seats by the driver reserved for people with disabilities and senior visitors. The rules about those seats are enforced! The shuttles to and from Tusayan to the park have drop-down entrances to accommodate we oldies. One late night returning to the hotel from the park, three paraplegics rode with us and were strapped in for safety by the well-trained and friendly shuttle driver. As an example, we hiked the 2 1/2 mile trail on the south rim going west from the Yavapai Geology Museum. The rim trail is asphalt with very few inclines. It was easy walking! There was a trail designated for handicapped individuals. We met people on crutches, using walkers and in wheelchairs, Now if you want to hike down into the Canyon, you’d better be in shape! Wear hiking boots-while we saw people in flip-flops and even high heels, the loose gravel and lack of railings made us think it is just not safe to wear flimsy or tipsy shoes. It’s no joke-about 12 people fall over the rim to their deaths each year. 4) Elk are EVERYWHERE! They are HUGE! Visitors are not allowed to feed or approach wildlife so the elk saunter up the lodge drives, cross the road and eat peacefully while walkers and bikers stream by. They don’t even look up! They ARE wild, however, and when the rutting season occurs from August to early winter, the males are very aggressive. Cow elk give birth in late spring/early summer and, like most moms, are very protective of their young- so stay clear. 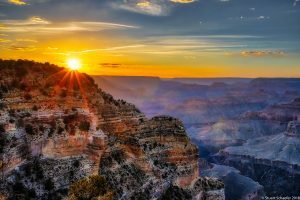 It was a golden hour view of the Grand Canyon. 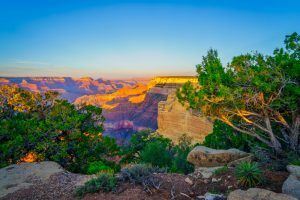 This shot was taken from the Powell Memorial location facing east to capture the colors of the canyon as the sun was setting. We were told that the elk fear visitors less than they fear the mountain lions-especially in spring when bearing young so choose to hang out around the lodges in the park. If you have an RV, beware! The elk will visit to steal your water and have learned how to turn your water on and off. Your rubber water lines make for great chewing and the spray of your broken hose can provide lots of fun for the elk! Elk are actually one of the most dangerous animals in the Grand Canyon Park. Rangers advise not getting closer than 100 feet. Watch for the California Condors, Ringtails, Bighorn Sheep, Abert’s Squirrel with tufted ears, and Little Brown Bats. Binoculars come in handy! 5) Sunsets,sunsets, sunsets!! WOW! One young man from Spain at Mohave Point told me he cried during the sunset. 6) After sunset, the vast majority of people head back to the Visitor’s Center or parking lots. The shuttles may be standing room only. Again, riders are required to give up those seats designated for people with disabilities and seniors. We had so much fun at shuttle stops!! Talking to people to compare notes, learn their stories, glean information about other destinations was a hoot! One dark night, we met a couple who had gone to high school together and recently reconnected-just like Stu and Barb (except they were 10-15 years younger than we are)! We really enjoyed hearing their story and they enjoyed ours-what an incredible coincidence! We traded blog cards because we couldn’t make out faces in the dark. Everyone was so nice, so fun, and so passionate about the Park. It is common sense, but after sunset, it is DARK!!!! Bring flashlights or head lamps. The parking lots are not lighted. Rangers told us that there is a project underway to rid the Park of all artificial lights and make GCPark a “dark spot” like Big Bend Park in Texas. Just be prepared and you’ll be fine. The Grand Canyon is far more than what we expected! Put it on your bucket list!